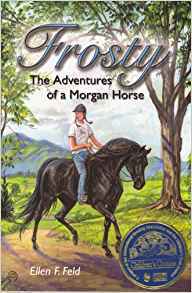 Frosty, the second book in the Morgan Horse series, continues the adventures of Heather Richardson and her horse Blackjack. In addition, the story introduces a new character, a rare gray Morgan named Frosty. Through Frosty, Heather realizes that not all horses are meant to be show ring stars. Great choice for any animal or horse loving teens. This book draws you in from the first chapter with anticipation you hope that Heather can buy the beautiful gray Morgan Horse, and if she does, what will the horse be like? It's a wonderful story of love between an animal and her human, and what listening to your animal can tell you. I also loved that Blackjack is still a vital part of the story, and his mysterious illness keeps the reader coming back for more. I appreciated that Ellen Feld researched and made sure that her terminology of the horses illness was accurate. All the way to the end I was intrigued and entertained.